Twilight was upon us. 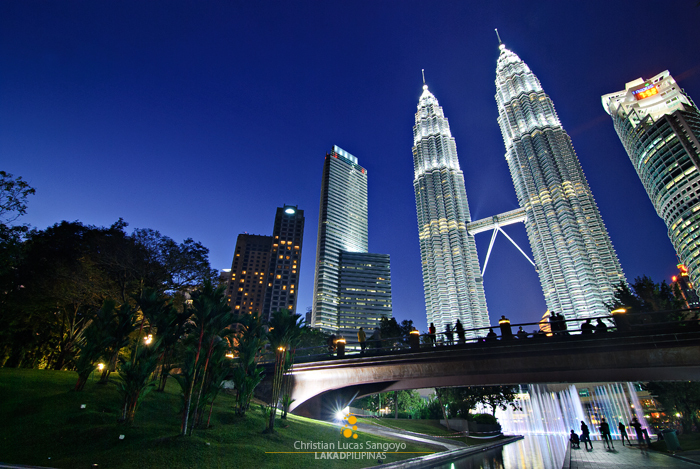 The twin giants of Kuala Lumpur in Malaysia shone and towered thousands of feet to the electric blue heavens above. 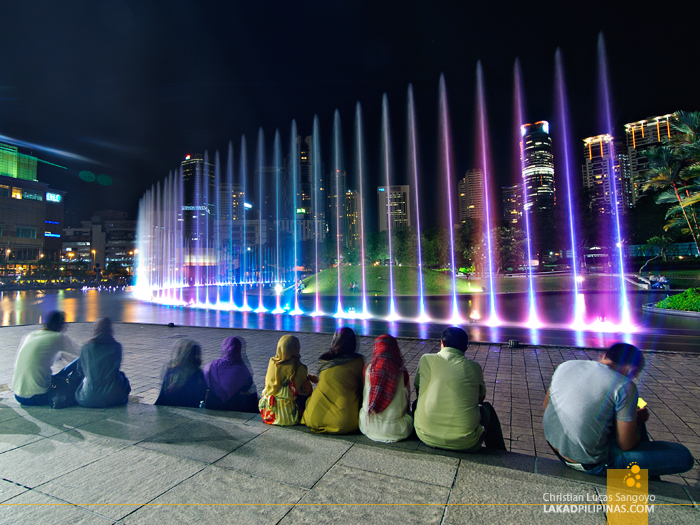 Below sat a menagerie of people, watching the fountains sway and undulate over music, gazing up at the sky once in a while to the twinkling spires of the architectural marvel that is the Petronas Towers. The scene was how I imagined it all to be, and more. 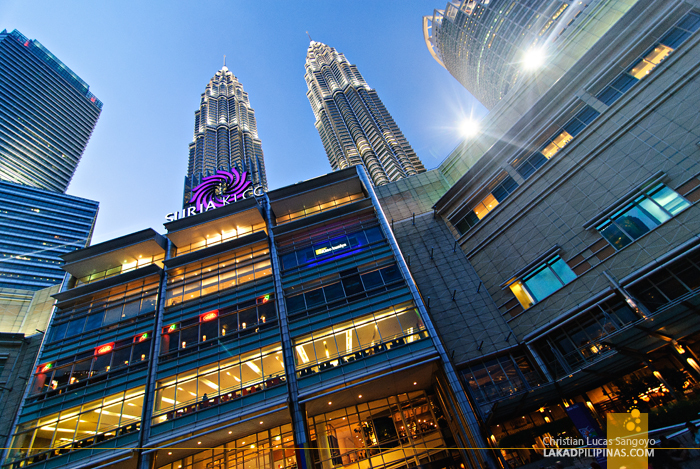 Coming from the Ceria Hotel in Bukit Bintang, we walked along the fading afternoon light before boarding the free Go KL green bus which passes through the KLCC—one of the largest shopping center in Kuala Lumpur. 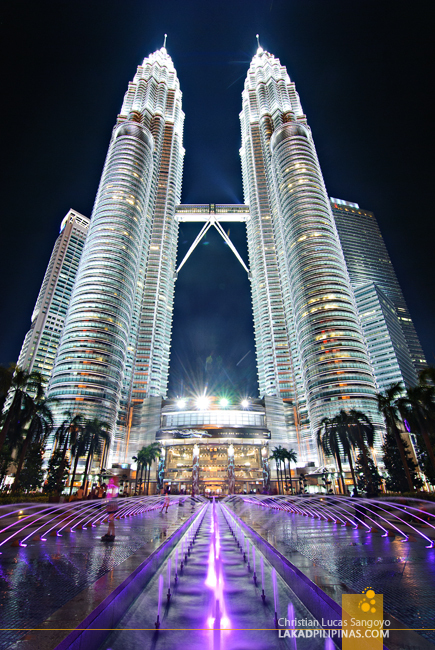 That said shopping haven is located right inside the Petronas Towers; but we’re not really there to shop though, we went there to gawk at the once tallest building in the world. 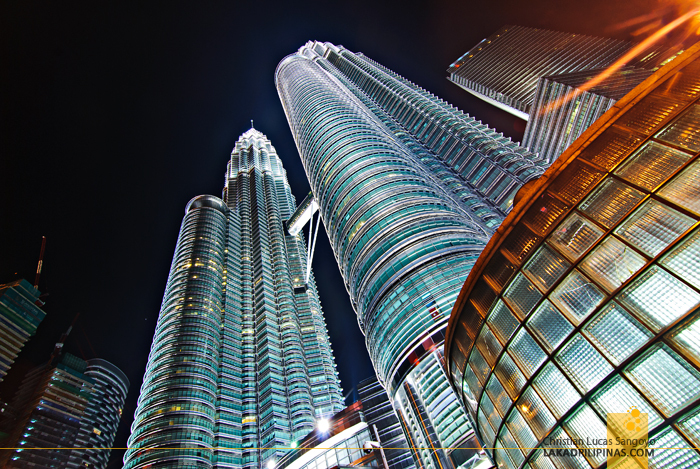 The Petronas Twin Towers, an 88-floor modern skyscraper made from concrete, steel and glass stands at an overwhelming height of 1,482.61 feet. It is three times the height of the Great Pyramid of Giza, but most of us haven’t really been to Egypt, so to put that into a better perspective, let’s go local. 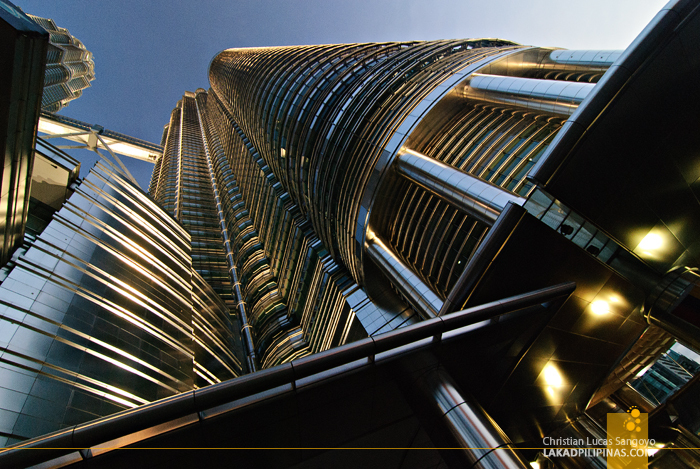 The twin towers of KL are almost twice the size of the highest building in the Philippines, the PBCOM Tower in Makati City. 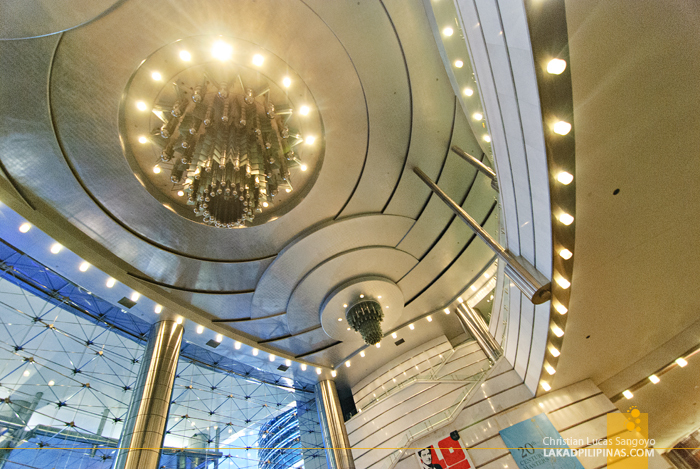 It once stood as the tallest building mankind has ever built for six years during the period of 1998 to 2004 before it was overtaken by Taipei 101. 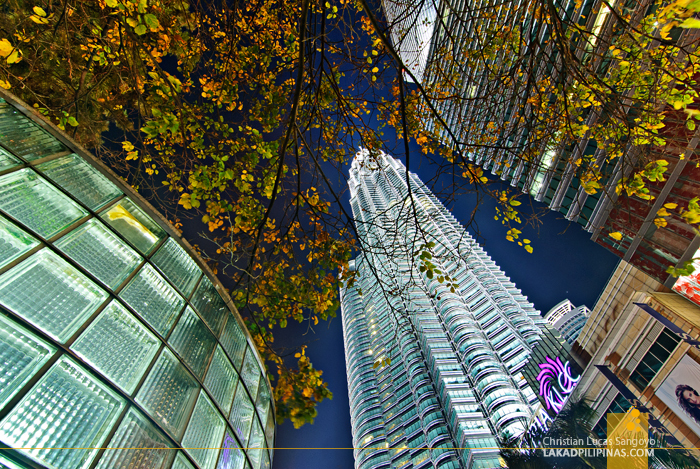 It has retained its record of being the tallest twin towers though, and that’s no small feat (pun intended). 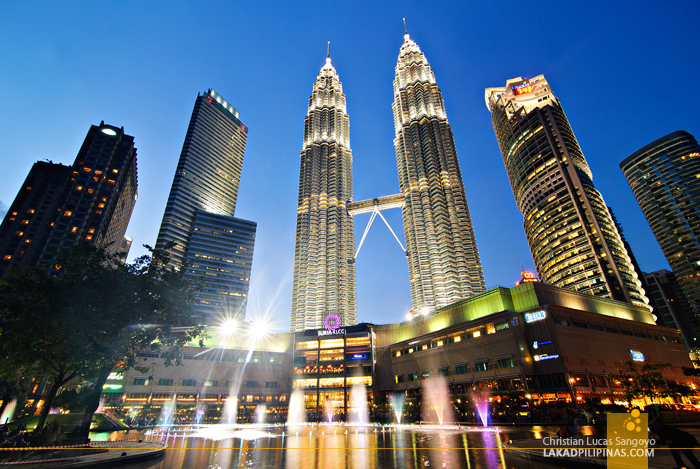 The post-modern styled building is designed by Argentine-American architect César Pelli. From its facade, one can see that it is no ordinary steel and glass skyscraper. Even from its modern material, I can clearly delineate a sense of local flavor. And indeed, it is as was intended by its architect who incorporated subtle Islamic art motifs, including the 241-foot twin spires that crown its pinnacle. Inside, the towers house the KLCC shopping mall, an art gallery, a science center, a philharmonic theater and an underwater aquarium. An underwater aquarium?! I was never aware that there was an aquarium at the Petronas Towers; if I knew then, I would’ve purchased a ticket to see it. Visitors are actually allowed to access the towers and cross its skybridge which is about 558 feet above ground. Access was once free, but there’s now an entrance fee for it. They have two packages, one for the skybridge access alone and another for the skybridge plus a visit all the way to the 86th floor of the tower. At its back, a lagoon and a man-made park are located. A fountain show is held during the early evenings. And one can see how popular it is with the number of local and tourists sitting along the lagoon banks, waiting for the show to start. While it’s not as grand as those in Singapore’s Marina Bay or even that of Vigan’s Fountain Show, it’s still a good enough spectacle to catch. Well, it’s free anyways, so why not. 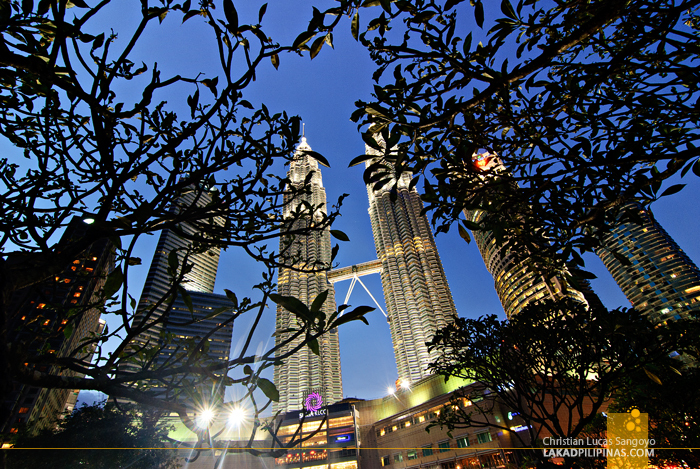 Walk farther and you’d find yourself on the manicured KLCC Park where most locals hang out. The tropical park, designed by Brazilian architect Roberto Burle Marx, is quite nice; lots of trees, lots of green space, with the lagoon snaking around it. It’s a pleasant place to set a blanket and maybe have a bowl of mee goreng and a take-away kopi ice from the nearby sidewalk hawkers. I remember seeing photos and design layouts of the Petronas Towers during my years as architecture student at the University of Santo Tomas. And I never realized that one day, I’d be gazing at this gleaming structure in real life.